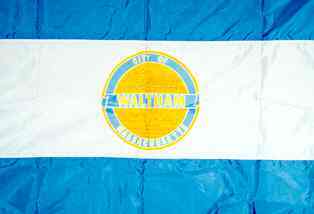 A blue-white-blue horizontal triband with the city seal at the center. The seal comprises a yellow disk with a blue band across it, containing the city name, and in a blue circle around it the words "CITY OF" and "MASSACHUSETTS". Waltham is in Middlesex County.